Can I buy a replacement usb charging board - my ne is broken. Yes, you can but you have to contact us directly via contact@makerbuino.com since the community members do not sell charging boards (I guess?). I’ll check when I get home, but I’m pretty sure that I have a spare charging board (I bought a second hand kit last month that had some components missing and some duplicates!). If you direct message me on Twitter (@andyhighnumber), I’ll see if I can help. If I can find it (will check later today) and you live somewhere I can post it to cheaply, you can have it for free. Hiya - ok, well I’ve found the board now, so can easily send it. But - given that it will be tomorrow before I get to the post office, and you’ve got one on the way from the supplier, is it worth sending still? No worries hang on to it I am sure mine will arrive shortly. @andyhighnumber, thank you for helping @Powertower out here, you desrve a special virtual badge for this. Thanks again for sending the board. Unfortunately I broke it trying to insert the plug. The new one is a better design as it has a couple of strengthening tags to resist the insertion force. They sent me two so if you need one I can send it to you. I broke mine as well the first time I plugged in. I managed to fix it though. I carefully aligned the tiny pins and reheated them with a tiny bit of solder. Then I reinforced everything by dropping a ton of solder on both sides of the outer shell of the connector. We’re aware of this flaw and will choose a better connector in the next MAKERbuino revision! 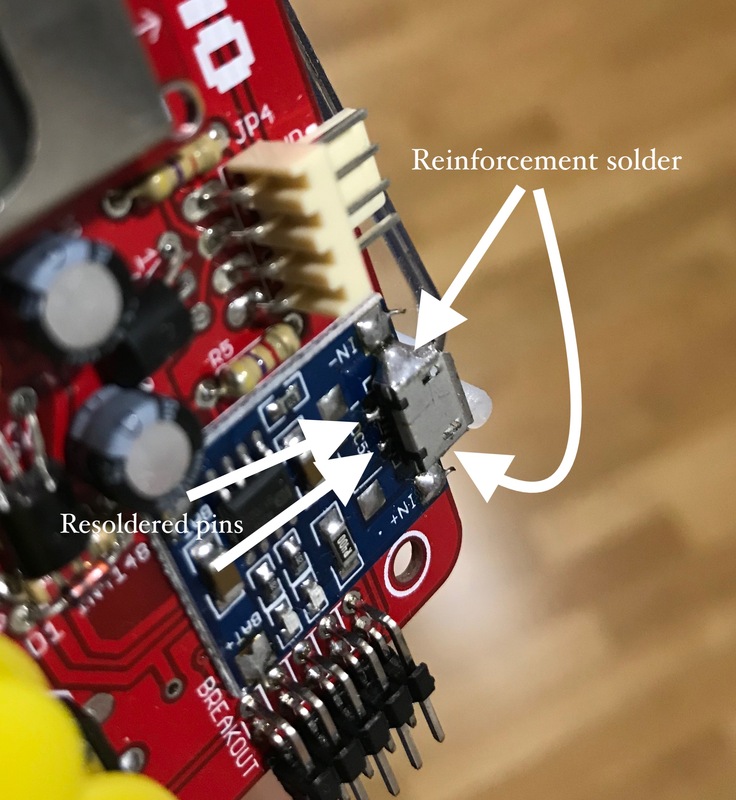 During soldering, a bridge was made between the area of connection ‘IN-’ and the metal casing where the charger is plugged in (the part where @drye put ‘Reinforcement solder’). Is this going to be a problem (i.e. messing up the connections) or nothing wrong can happen even if the bridge stays there? Also if the extra solder needs to be removed, does anyone have an advice if it’s possible to remove it without wick or pump?